Crofts estate agents are pleased to offer for sale with this modern TWO BEDROOM mid terrace property which is located within the ever popular Laceby Acres development. 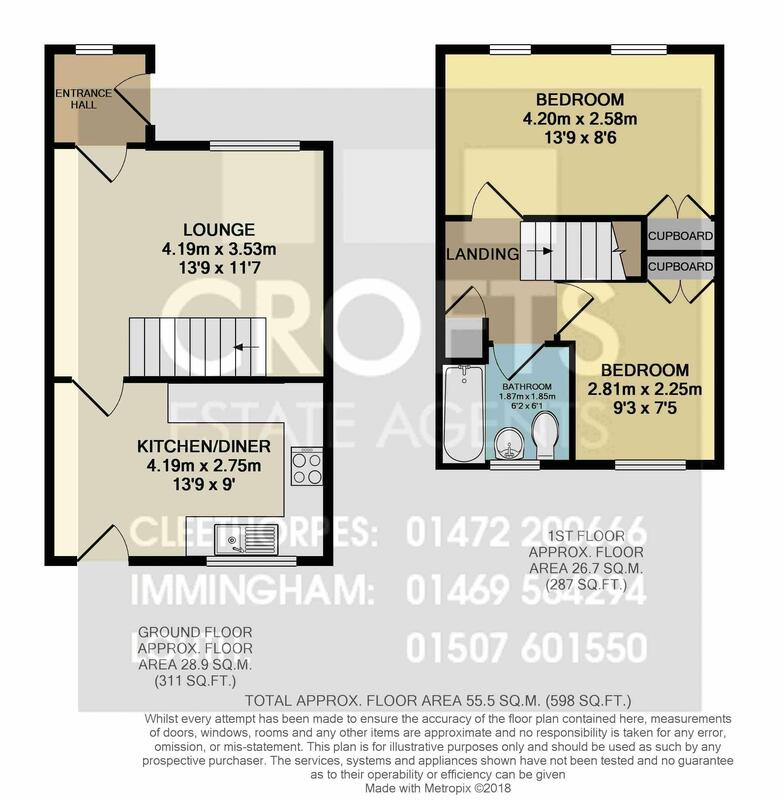 Ideally suited to a FIRST TIME BUYER or buy to let INVESTOR, this property is sure to be popular and therefore comes with VIEWING HIGHLY ADVISED. An extra plus for this property is the ALLOCATED PARKING which is accessed from the gate in the rear garden. Internal viewing will reveal a tasteful MODERN DECOR throughout with an entrance area which then opens into the lounge, the kitchen has a range of fitted units and space for a table and chairs. To the first floor there are two double bedrooms and the bathroom which has a white suite. Externally there is a low maintenance rear garden and allocated parking. The property also benefits from uPVC double glazing and gas central heating. Entering into the property through the front door reveals a window to the front elevation and laminate flooring. The lounge has a window to the front elevation, coving to the ceiling, a radiator and laminate flooring. There is also feature wall paper and access to the stairs. The kitchen-diner has a window and door to the rear elevation, a radiator and laminate flooring. There is also a range of fitted units to base and eye level in a high gloss finish with complimentary tiling, a sink and drainer and plumbing for a washing machine. There is also space for a table and chairs. The first floor landing has access to the loft, a storage cupboard and carpeted flooring. Bedroom one has two windows to the front elevation, coving to the ceiling, a radiator and carpeted floor. There is also a built in cupboard. Bedroom two has a window to the rear elevation, coving to the ceiling, a radiator and carpeted floor. There is also a built in cupboard. The bathroom has an opaque window to the rear elevation, fully tiled walls, a heated towel rail and vinyl flooring. There is a white, three piece suite with a WC, basin and bath with electric shower and glass screen over. To the front there is a small lawn with a footpath providing access to the front door. The rear garden is enclosed by perimeter fencing and conifers and has a gate leading to the off road parking. There is then a low maintenance garden with a patio area which is ideal for alfresco dining.